Rerun is the best way to keep up with the changing world of digital storytelling, interactive media and the future of TV. Curated by Axonista and published Fridays! We've had a lot of fun this year writing Rerun! In this edition we review some of our favourite stories from 2017. 2017 was the year where new interactive trends began to emerge with Vine's HQ and Soderbergh's Mosaic. It has also been the year where platforms grew as the content destination of choice for viewers. We're really looking forward to next year and can't wait to see what 2018 has in store! This year we have really enjoyed bringing you Over the Top, a video and podcast series which gives you all the latest news on OTT, and the future of video from some of the best in the business. Each episode is available for download on iTunes. By combining the interactivity of gaming, the allure of live video and the production value of Hollywood, HQ feels more alive than most anything on your phone or TV. HQ is important because it displays that interactive video can be so much more than streams of comments and reactions. It's a rapid-fire live trivia show that blurs the line between video and interactive content, not just in format but in production value as well. It broadcasts just twice a day, but the broadcasts are intensely paced and focused. 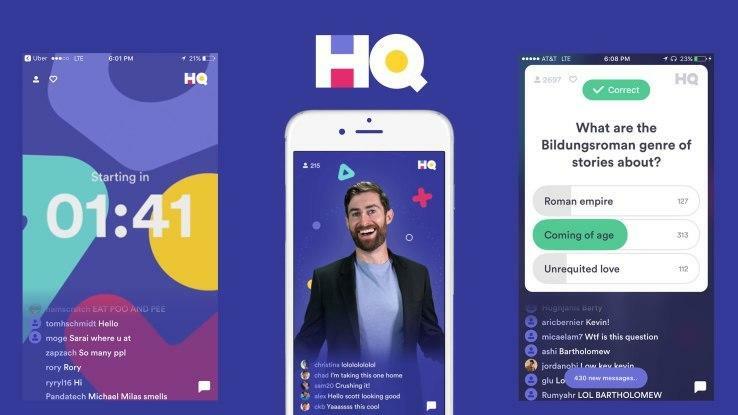 In an era where apps are desperate to grab and keep hold of your attention, HQ's short and rewarding bursts of content are a breath of fresh air. This comprehensive feature by The Verge offers an unprecedented look into the long road of design & development that went into Hulu's new live TV service. It covers everything from research, to visual exploration, to metadata wrangling, to streaming and playout performance. It's rare to get such an open sharing of learning and process in this industry, especially at the scale of Hulu. The extent of their design and development goes down to the level of knowing what episode of each show you'd want to start with, which could be different depending on if it's a linear series or a talk show. They also learn from your habits and offer recommendations, and it's not just based on what you watch but what device you're watching on. And after 18 months of work by 100s of people, there's still the humble admission that there's still a lot more improvement that can be done. No need to rush, most of the money has yet to come. 65% of total ad revenue is still in traditional. $250bn sitting in TV and print has yet to move over to digital. By publishing to satisfy ever-changing platform algorithms, you only commoditise your content and your brand. Instead you need to cultivate a direct relationship with your audience, and do things that platforms can't do. Partnerships with platforms are key for engagement. For example Bloomberg's TV partnership with Twitter (airing Bloomberg shows on Twitter) has an engaged audience that both Bloomberg and Twitter are able to monetise in an equitable way. What happens when new forms of storytelling and technology to tell those stories line up? Mosaic, an interactive mobile app that takes you through a story from the perspective of multiple characters. Tech caught up with the idea, which first came to creators Casey Silver and Dan Siegel in the late 1990's. The 500 page script filmed over 49 days—and edited into 8 hours of final footage—is now available on iPhone and Apple TV. HBO also backed the project with $20 million under the agreement that it could also air as a linear mini series. Mosaic doesn't only impact the viewing experience. Director Steven Soderbergh was adamant about his actors not knowing how the story would progress. A murder takes place, but the actors don't know who will commit the crime or be its victim. Back in June, Netflix premiered 'Puss in Book: Trapped in an Epic Tale', a choose-your-own-adventure movie for children where viewers decide how the story unfolds through interactivity. It's recently been announced that a TV show is in production that uses the same type of interactivity, but aimed at adults. News of this announcement has already started a conversation around how our favourite shows might be made better or worse by interactivity. Interactivity has the potential to be an intrusive and distracting addition in longer form content. At Rerun, we believe the success lies in the execution. Interactivity is a tool for writers and directors to tailor a creative and immersive experience, it must feel as if the story couldn't be told without it. Not only that, but how the choices are presented to the audience is just as important. We're looking forward to learning more! This is a fascinating read on the various successes and failures that YouTube has had on its journey from being a search-first website to becoming a content-first destination. With all the approaches they tried, both logical and left-of-field, the one that really moved the needle was a change to how they recommend content: Instead of basing its algorithmic recommendations on how many people had clicked a video, YouTube would instead base them on how long people had spent watching it. Nearly overnight, creators who had profited from misleading headlines and thumbnails saw their view counts plummet. Higher-quality videos, which are strongly associated with longer watch times, surged. Watch time on YouTube grew 50 percent a year for the next three years. Jon Steinberg, CEO & co-founder of Cheddar, explores the long-term value of 'ambient' TV, live, news brands, and bundling. Many publishers have become distracted by the metrics coming from social network feeds, producing content that panders to it at the cost of their long-term brand value, so Jon's points about the benefits of bundles and 'neighbourhooding' come across as quite strong. In this single-mega-neighborhood scenario, poultry, twinkies, lettuce, ice cream, whole wheat bread, and Entenmann’s coffee cake are all in one mega-aisle interspersed. Of course, shoppers can only see the brightly labeled snacks, and before you know it, everything becomes snacks. Intentional programming grows brand trust and loyalty, which viral video will never have. Intentional programming explains why existing cable networks with audiences that seldom surpass 100,000 to 200,000 concurrent viewers, make hundreds of millions in annual revenue, while video producers pulling in billions of monthly views make little. We’re talking about a 360-degree view of intellectual-property exploitation that hasn’t really been seen before. A world in which a new Star Wars movie hits theaters, and then is available for streaming only on Disney’s service. The same service that is the exclusive home for new Star Wars television shows. And then that same company will offer fans the opportunity to actually visit the lands they’re watching through Disney’s theme parks, and then read about them in books and comics put out by Disney publishers. It’s a holistic ecosystem of entertainment, all under one corporate umbrella, with each division pushing audiences to engage with every other division. Rupert Murdoch has announced a $66 billion deal with Disney to sell some of his assets. The ever expanding Disney umbrella now includes, Fox Networks Group, a 39% stake in Sky, and 20th Century Fox. Along with previous acquisitions like ESPN, ABC, Hulu, Pixar, Marvel, Lucasfilm and their existing Walt Disney Studios, theme parks, and merchandising wing, Disney is now truly an empire. Earlier this year, Disney announced it was pulling its films from Netflix US to compete with its own service from 2019. Fox’s content will help build the attractiveness of the digital TV service, with a sport version also planned for ESPN. As the curtains fell on Apple's latest product launch, one feature has raised an eyebrow. The Animoji tool makes use of iPhone X's facial tracking technology to animate an emoji with your expressions. Now you can record looping animated messages in real time and send them to your friends. “If you were wondering what humanity would do when given access to the most advanced facial tracking technology available, you now have your answer." said Apple executive Craig Federighi while turning his face into a talking poo emoji. That's it for 2017. From all of us at Rerun, we wish all our readers a very Merry Christmas and New Year. We'll see you on January 12th for the first 2018 edition of Rerun!